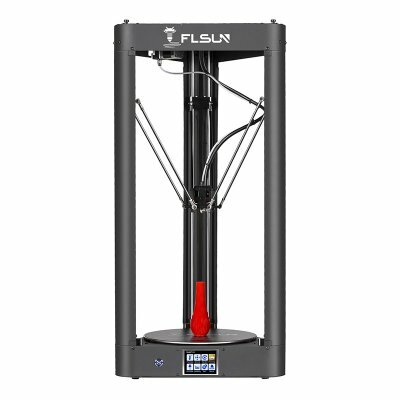 Successfully Added FLSUN QQ Wi-Fi Remote Control DIY 3D Printer Kit to your Shopping Cart. Achieve 90% pre-assembly, easy to start printing; Complete instructions and video, fresh man could control it. Innovative automatic leveling technology, making leveling more sensitive and accurate; Auto leveling once, permanent printing, store the leveling data. 260X370mm printing size, big is the last word; same price, larger size, free your imagination. End of the printing process or accidental power failure, you can boot to continue, do not have to worry about the waste of time and supplies. Noise below 50 dB, especially outstanding, Quiet work, life and night. Phone controls the printer, making settings and controls more Convenience; Slicing and downloading the model in 'Cloud'. Ultrahigh printing speed: Print faster than the average printer about 30%. Full-color touch screen control, support offline printing and Power off repeatedly. Self-developed flexible extruder, remote feeding can easily print flexible supplies. Omni-directional cooling system: Nozzle cooling fan and supplies cooling fan make the high precise; Install the motherboard, power supply and motor cooling fan in the base, make printing more stable. This 3D printer is a great gizmo for artists, hobbyists, teachers, and professionals. With its wide range of filaments, large printing volume, and easy to use design – this printer kit is easy to use by anybody out there. No matter what your upcoming project looks like, this 3D printer is guaranteed to meet your demands. The DIY Flsun QQ 3D Printer Kit comes with a 12 months warranty, brought to you by the leader in electronic devices as well as wholesale 3D Printers..